Hmmm, not strictly true. Sala had been to Cardiff and signed for them, he was their player. A closer analogy would be buying a sofa, having it delivered, then deciding to put the sofa back in the lorry and the lorry crashing. The question is at what moment is a player deal finalised. When he signs? For instance, in the movie business, most contracts for above the line talent are payable in full the moment cameras first roll on principal photography. You as an actor might not personally film for several days. But if cameras roll. You are owed money. If they don't.. You re-negotiate or go to court. 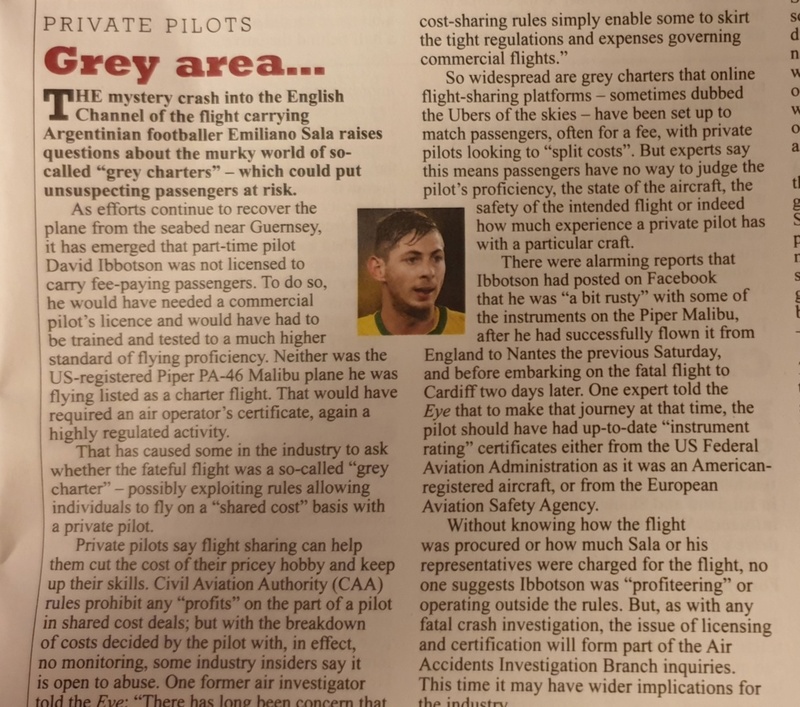 I see, seems they have to pay up then, clubs are rather daft to allow contracted, expensive players to make their own flying arrangements. Most big transfers don't pay out straight away I'm sure so I get why Cardiff are holding back paying it out. Who knows when the buying club becomes liable for a player? Worth speaking to the lawyers about it anyway. Once they know where they stand I'm sure they'll pay up the first installment. I do think they are milking the whole thing a bit though now. The guy never even played for them. He might have turned out to be donkey but he's now a legend. Warnock looks like he hasn't slept in a month and the players are having the week off to spend with their families. I doubt if any of the players had even met him yet for God's sake. The Lecester owner's death was something completely different and I understand why the fans and players were so affected by it but Cardiff are milking it. Would it even be classed as an act of god? Damn sure the lawyers will be milking both sides for as much as they can. Lol I'm sure they would have been scrutinising the contract if he'd scored three goals in his first game. Feckin lawyer scum.